The Federal Reserve said Wednesday that its stimulus campaign would press forward at the same pace it has maintained since December, putting to rest for now any suggestion that it was leaning toward doing less. Another symptom of our demand-weak economy, along with high unemployment and weaker job creation, is the recent deceleration in price growth, shown in the figure below. The Fed's "...statement also noted that the pace of inflation had slackened, a potential sign of economic weakness, but it showed little concern about that trend." Me, I'm pretty concerned about that trend. On the one hand, lower price growth means higher real wages, all else equal, and that's important as slower nominal wage growth is another problem right now. 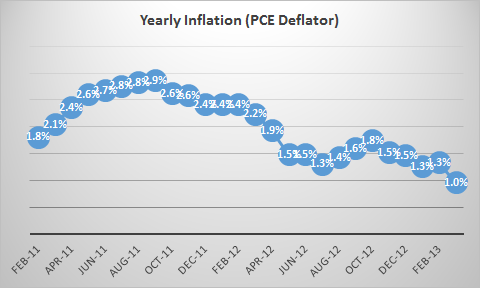 But on the other hand, low inflation is problematic in ways that are less obvious than the real wage story above. First off, faster inflation means lower real interest rates, and since the Fed's already at zero (and can't go lower), a bit more inflation would help in that regard. I'd bet we'd see more investment bucks move of the sidelines if that trend in the figure were to reverse course. Higher inflation also chips away at nominal debt burdens and thus hastens deleveraging. But the deeper, and more interesting, reason one worries about too-low inflation right now comes out of the work of Ackerlof et al back in the mid-1990s. It has to do with sticky wages, something Keynes recognized as contributing to intractably high UK unemployment back in the early 1920s. Back in the mid-90s, we also faced a period when price growth was slowing, and inflation hawks called for the Fed to set zero as their inflation target. Greenspan apparently took it seriously, and internally debated the idea. That inspired Akerlof et al. to think about what might happen in a zero inflation economy, and what they found was that it would engender significant costs in terms of unemployment and growth. As long as there's a little inflation in the system, "less fortunate" firms can give nominal wage increases below the rate of inflation, allowing them to adjust to harder times. With very low inflation, they don't have the room to pull that off. Now, I suspect some readers are thinking "hmmm... real wages too high?... that doesn't exactly sound like our problem right now or anytime soon." You've got a point. To the extent that worker bargaining power is so weak that firms can just jam wages down as much as they like, the fundamental sticky wage part of story disappears. But from what little recent evidence I've seen, nominal wages for incumbent workers are still pretty sticky. If you're lucky enough to have a job, think about your own case. I suspect you haven't seen much in the way of raises, but has your salary actually been cut in nominal terms? If not, and as long as demand remains weak in our 70 percent consumption economy, with fiscal policy pushing the wrong way -- note that Bernanke and Co. dinged the Congress in today's statement: "...fiscal policy is restraining economic growth" -- firms will continue to want to "adjust" wages. The fortunes of firms continually change, and inflation greases the economy's wheels by allowing these firms to slowly escape from paying real wages that are too high without actually cutting the wages they pay. This adjustment mechanism allows the economy to avoid a large employment cost. At very low rates of inflation and productivity growth, such adjustments are short circuited, and employment suffers.